The rotational form of Newton’s second law states the relation between net external torque and the angular acceleration of a body about a fixed axis. The result looks similar to Newton’s second law in linear motion with a few modifications. First consider a case where all the mass is in one place. Suppose a point object of mass attached to a light rigid rod of length is rotating about an axis perpendicular to the rod and passing through its end. A force acts on the particle to increase the angular velocity of rotation. Break the force into its components. One component is towards the axis and called the radial component of force and the other component is in the tangential direction . The torque of the radial component about the axis is zero as the line of action of the force is passing through the axis itself. The torque of the tangential component will try to increase the object’s angular velocity and produce angular acceleration. The acceleration of the particle along the tangential direction will be . For motion along a circular path, the object’s angular acceleration will be , where is the radius of the circular path of the particle, which in this case will be the length of the rod. If the relative distance between any two particles on a body remains the same throughout the motion, then the body is said to be rigid. Such a body maintains its shape and size irrespective of the forces acting on it. 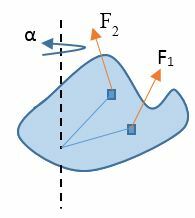 If a rigid body is rotating about a fixed axis and multiple forces are acting on it to change its angular velocity, then the body can be considered to be made up of many small point masses attached at the end of massless rods and rotating about the same axis. As the body is rigid, all the particles complete their circular motion together and the angular acceleration for all the particles is the same. Which one rolls faster down a hill, a hollow cylinder or a solid cylinder? Consider both are of equal mass and radius. If the two objects are of the same size and mass, then the external torques will be the same. The hollow object has a larger moment of inertia as the mass is spread away from the axis. As , for a given torque, its angular acceleration will be less. This remains true even if the objects have different masses. This is because the mass cancels out of the equation: the torque due to gravitational force is proportional to the mass, as is the moment of inertia. 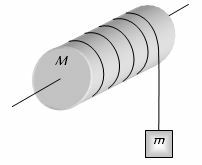 A rod of mass M and length L hinged at one end without friction and held horizontally is suddenly released under gravity. Find the angular acceleration of the rod just after the release. A rod hinged at its left end is released under gravity. , force due to the hinge on the rod. About the hinge point, the net torque equals the vector sum of torque due to the hinge force and the gravitational force. Torque due to the hinge force about the hinge is zero because the hinge force passes through the hinge. Rotational Form of Newton’s Second Law.